it's a plugin which allows you to load text-based files as Resources, to be used as desired (translations, dialogs, ...) inside Duality. for the moment it lets you import and create txt, xml and xsd files, and csv files; automatically detects changes in the files and reloads them when necessary. The Resource's content are available in the aptly-named Content property as a string, depending on the type of the source file, via one ore more properties and/or methods. 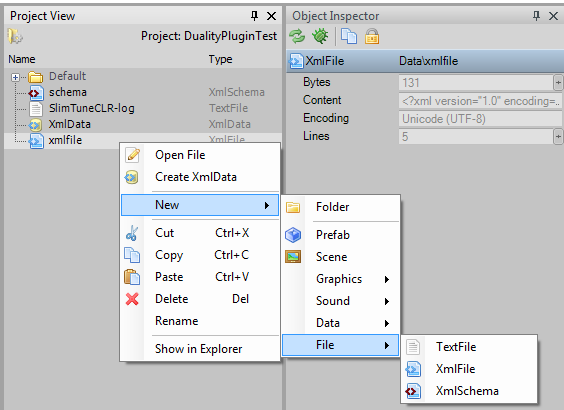 XmlData Resources are validated xml/xsd pairs whose contents are available from the XmlDocument property as an XmlDocument. Validation is performed whenever the xml or xsd are changed and eventual errors are displayed in the editor's log panel. CsvData Resources are "validated" (a check is performed to verify that all the rows of the file contain the same number of fields) and their contents are available as a matrix that you can access in a number of combinations via Row, Column, Index (the first column of each row, if unique, can be used as a searchable index), Field (the contents of the first row, if unique, can be used as field names for the other rows), or any combination of Row/Index and Column/Field. JsonData Resources are validated json files whose contents are available from the JsonObject property as a dynamic object. All is managed internally in .net4 and no external dependencies are necessary. All files can be opened directly in their default editor Notepad using the new Open File contextual menu command by doubleclicking and, when saved, the linked Resources are automagically reloaded and eventually revalidated. As always I am open to suggestions.. binary data import? csv parsing? Of course! All classes that are public are open for grabs. You can use them as a building block to develop your own custom file importer. Just extend the base class depending on the type of file you want to use as source (txt, xml or csv) and override method AfterReload (it is called everytime the file is loaded - be it first creation or after a change in the contents) and parse the file as you prefer. Let's say I want to be able to configure my plugin by saving the default editor's path (i.e. Notepad++ instead of Notepad) somewhere; what would be the best choice? something in the CustomData property of DualityAppData? or another type of AppData? or something else? [EDIT] Sorry, I was editing my question while you were posting your answer..
[08/11/2014] First release. Thanks to everyone (especially Adam, BraveSirAndrew and existable) for their help in putting together all the pieces of the puzzle. Hope this will be useful to someone. [04/02/2015] Added a couple extra utility methods for JsonDynamicObjects. [03/11/2015] Upgraded for Duality 2.x; Validation of xml via xsd is not available anymore, due to the inability to have xml/xsd validation in PCLs. Last edited by SirePi on 2015/02/04, 17:08, edited 13 times in total. Let's say I want to be able to configure the default editor (i.e. Notepad++ instead of Notepad); what would be the best choice? something in the CustomData property of DualityAppData? or another type of AppData? or something else? As of now, Duality simply uses Windows defaults to open all external files. This will definitely change at some point in the future via a centralized editor options menu, but there is no ETA on that and this is also not a priority right now. Until then, feel free to roll your own solution when you consider it necessary - just don't grow too accustomed to it as there may be an official API in the future to move to. All files can be opened directly in Notepad using the new Open File contextual menu command and, when saved, the linked Resources are automagically reloaded and eventually revalidated. // Some nice display text like "Opens the fancy XML stuff externally"
You can find the default implementation for Pixmaps, Shaders, etc. here. The Resource's content are available in the aptly-named Content property as a string. I would suggest to use the invisible flag so the content isn't even visible in the Object Inspector directly. Just imagine someone pulling a 10000 Kb XML monster in there. Which is an actual case to consider for huge data sets! You really wouldn't want the editor to get stuck putting that into the Object Inspector. In addition, you can create XmlData Resources, which are validated xml/xsd pairs whose contents are available from the XmlDocument property as an XmlDocument. Validation is performed whenever the xml or xsd are changed and eventual errors are displayed in the editor's log panel. The auto validation is a great addition! If there's manual editing, there will be human errors. On a different note, I don't get one thing in your general design: Why do you even separate XmlFile and XmlData? I can't really imagine a useful case where you would have an XmlFile without an XmlData attached to it - after all, you will parse that XML anyway at some point - so you might as well merge the two classes and keep everyone's project directory a little more tidy. You could still (optionally) reference an XmlSchema from XmlData, do your validation, allow editing them externally on double-click, etc. I guess what I'm trying to say is, I don't really see how XmlFile adds any value besides being a source for XmlData and it adds complexity. Just imagine I would've defined PngImageFile and JpegImageFile Resources (raw files), which are referred to by a Pixmap (parsed image)... the project view would be a mess for no added value! Illustrating this with an example, let's assume you have an XmlData Resource in your project when some outsourced guy comes along and says that he switched tools and can no longer provide XML, but only JSON from now on. No problem! You can write a custom FileImporter that takes a JSON file and converts it to an XmlData Resource, so you can now import both JSON and XML and still get a mostly uniform XmlData, which can validate against your existing XmlSchema. Actually, I have to admit that this specific example makes me cringe a little bit, but I think you get the point Resources shouldn't care which kind of file or file format they came from, and raw files should be sources for FileImporters, not Resources on their own. EDIT: Re-reading this, it feels like I'm bashing design choices in your newly created plugin. This really isn't how this should come along! I just want to point out this thing with the conceptual consistency between your plugin and Duality that I think might have slipped attention otherwise. You mean I could doubleclick on a Resource and its default editor would open? I never knew that! Ah, that's just a leftover from my first tests (I took the Shader with Vertex and Fragment files as an example); now there is only XmlFile. No worries it's good to have someone make me think twice on what I'm doing. Would you mind to think about renaming it to XmlData? I think XmlData and XmlSchema were excellent names. I mean.. seriously? Not sure whether I can improve on this without getting destructive under certain circumstances though... but it's definitely on "the list". Not a problem, but this leaves me with the issue of having a TextFile (as in, a simple .txt) Resource. Which is nothing more than a string.. following your reasoning I would be leaning towards going back to have it as an abstract Resource used internally by all the other specializations (xml, json, csv..), but on the other hand, you prefer not to have big strings going around the property editors, and it could always be edited in order to expose also a string property called Lines. Maybe I could just rename it StringData? The downside of no relation between these classes is potential code duplication, but if that code is really just a single field and property definition, then that's a pretty small downside. On the other hand, the upside would be the ability to specialize each data Resource more towards its actual use: Borrowing your example, PlainTextData could have (editor-invisible) Content and Lines properties without accidentally adding them to XmlData and XmlSchema as well, where they don't really make sense and thus shouldn't be available. It's not something that is definitely wrong, or I believe to be bad design, it's just.. bugging me somehow. Maybe there really is a better way to do this, or maybe you're right that it's already fine the way it is. I have reworked the inheritances and some utilities around, and now it's quite stable, and in addition it now allows access to csv data as it were a table: you can access it based on row/column, only row, only column, and if you set it, also with a sort of index (first column) or field (first row)-based lookup. I think I only need to completely comment the various classes, check how it works with the latest Duality Resource changes, and then I can start working on the nuGet integration part. For any issues or requests, just drop a message! Awesome Just installed your plugin in a fresh Duality installation and it works. Also imported some XML files via dragdrop and marveled all those shiny new editor icons in the Project View. Your packages don't specify a title or icon. You should definitely consider adding both for future versions! Makes it more shiny and inviting to try them. When changing the ID, your new package version will be disconnected from the old one. That's fine when doing it now before it is widely used, but you'll have to manually unlist the old package on NuGet.org when viewing your packages while logged in. Ideally, the package ID matches the main namespace of your code. Still, not a requirement, but also a scheme I'm trying to follow. Just a suggestion! The category of the XmlSchema Resource is "File", but I think it wouldn't be too far off to just put it into "Data" besides the others as well. That way, all of your plugin additions would be nicely grouped. [Edit] ERROR: Unexpected XML declaration. The XML declaration must be the first node in the document, and no white space characters are allowed to appear before it. Line 62, position 3. I'm pretty sure there also was an unhandled exception, but apparently it somehow didn't make it into the global handler for them and thus wasn't logged. Hope this feedback was helpful. I'll look out for updates!